Fly fishing in the Smokies | Hookers Fly Shop and Guide Service. Your Smokies Fly Fishing Experience. Fly fishing in the Smokies. 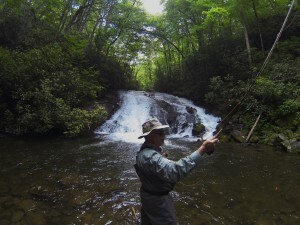 Guided fly fishing in the Smokies. 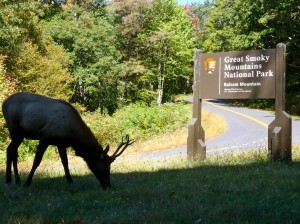 The Great Smoky Mountains National Park offers some of the best fly fishing opportunities in the Southeast. Let Hookers Fly Shop and Guide Service show you what fly fishing in the Great Smoky Mountains is all about. 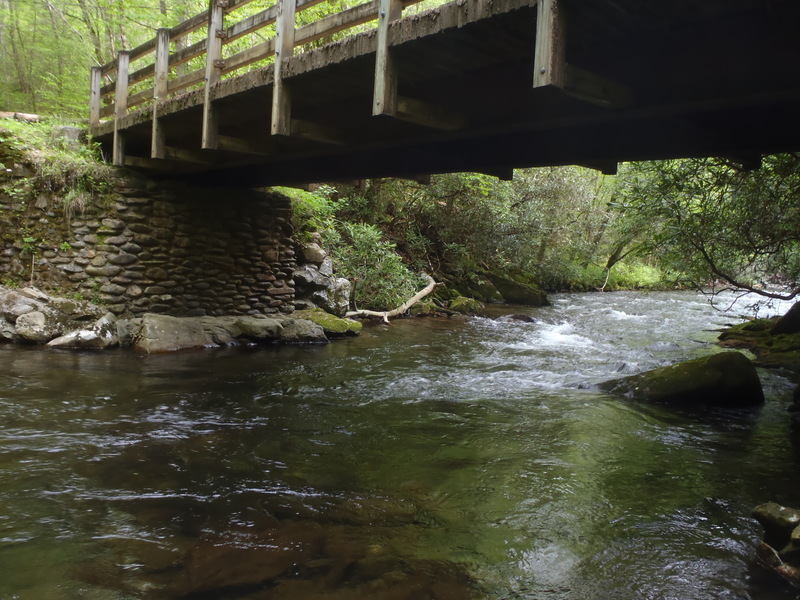 There are dozens of streams in the Smokies and most of them are home to Rainbow, Brook and Brown trout. Some of the lower elevation streams even hold smallmouth bass. While a few of the streams have all three species of trout there are a few of the higher elevation streams that only have the Brook Trout or “Specks” as most of us locals like to call them. 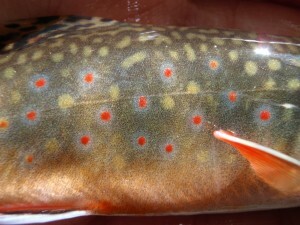 In fact, the brook trout that are found in these mountains are unique only to the Southern Appalachian Mountains. These fish tend to be much smaller than the more well known Northern Brook. This beautiful specimen is the only native trout to the area. Pictured below is a beautiful Southern Appalachian Brook Trout from Straight Fork, which is located just north of Cherokee, NC. On our guided fly-fishing trips in the Smokies you can do a half-day, ¾ day or a full day trip. All of these trips are wade trips and we provide all the necessary gear for a day in the Smokies. Full day fly fishing trips in the Smokies also include a stream side lunch. If you are the more adventurous type Hookers Fly Shop offers overnight backcountry trips to the more remote locations of the park. Many of our overnight fly fishing trips are on Hazel Creek. We can hike in, boat in or even paddle canoes or kayaks in. Our backcountry trip leader, Jason Cole has plenty of knowledge and information about staying and playing in the backcountry. Jason has been backpacking and camping in the remote areas of the park since he was five years old that’s almost 30 years of backcountry experience. He has been leading trips professionally for over 11 seasons now. If you would like more information about these trips please feel free to email or call. If you have more than three anglers you will need to have an additional guide. We can take groups up to 20+ anglers. Church groups, corporate groups as well as children are welcome. Half Day Wade $150 1st angler plus $60 each additional. 3/4 Day Wade $190 1st angler plus $65 each additional. Full Day Wade $225 1st angler plus $75 each additional. Half Day Float for Two $300. 3/4 Day Float for Two $350. Full Day Float For Two $400. Single angler floats are 10% off the prices shown above. 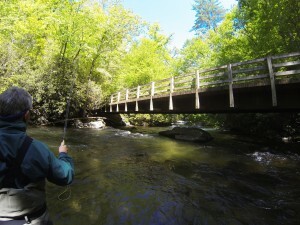 Guided fly fishing in the Smokies. To book a trip please email us at hookersflyshop@yahoo.com or call us at 828-587-4665 Click this link to book online.